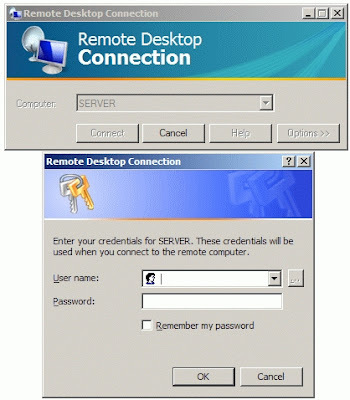 Remote Desktop Connection client 6.0 introduces new authentication features to improve security for Windows Vista and Windows Longhorn Server, which makes it mandatory for the user to enter logon credentials before RDP client can establish connection to the remote server (" Enter your credentials for <server>. These credentials will be used when you connect to the remote computer" ). But if the remote machine is configured to show logon warning message or if the remote system happens to be Windows 2000 or XP, you’ll need to enter the credentials again at remote machine’s logon screen. There is however a workaround to skip the credentials screen that RDP 6.0 client shows by choosing “Do not attempt authentication” under Authentication options on the Advanced tab, but this option is not set permanently. To permanently skip the additional credential screen of RDP 6.0 client, edit the Default.RDP file in notepad to include enablecredsspsupport:i:0 . The Default.RDP is located in each user’s My Documents folder. Including enablecredsspsupport:i:0 disables the Credentials Security Service Provider for the connection. If you use separate .RDP files for different server, modify each of those .RDP files. Below is the content section of the default.rdp file with enablecredsspsupport:i:0 option included. Note that this workaround is suggested only if you connect Windows 2000/2003/XP systems because according to Terminal Services Team blog post – “This option does disable the new credential prompting behavior, but it also disables support for Network Level Authentication for Vista (and Longhorn Server) RDP connections; Network Level Authentication requires credentials to be provided by the client before a session is created on the server side.” So if you do connect to Vista/Longhorn over RDP, you’ll not be able to use this option. you are a saviour and a saint. I cannot believe that i would have to suffer getting "localservername\username" in the username box in rdp every single damn time i used the program, regardless how i previously connected. Excellent post. Did you get this from some set of tech-docs. I wonder what other non-default settings there are to regain the functionality of the previous client. I use Vista Business Version and in my case the TS keeps asking for domain level authentication inspite of me providing the correct password. I connected from a windows xp box and it is connecting using the same credentials. I set the registry entry AuthenticationLevelOverride to zero and still I have the same problem. The server is running Windows 2003/2000. Any suggestions? This is Venkat again. I figured out what was the problem. Thanks. Legend - Recently Deployed new Citrix Farm with 50 custom rdp connections. This Saved alot of hassle and is a great workaround. Informative feature in your article. I would really like to see it. Thank you. interesting read. Thanks for taking the time to put together this list.